Today, I read Velvet Pixals blog, she posted about 20 things she was grateful for. This inspired me to consider things I am grateful for. 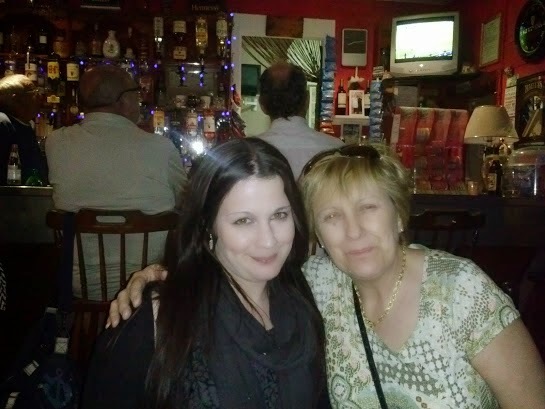 Photograph - of my Mam and me in Malta, in her local pub. My Mam is the first thing I'm grateful for, even though we may not agree about things. At times I can be a huge pain in the Keister, at times, subsequently, when I need her she's there . I live in Britain, I have the freedom to live, practice and do what I want within the legal limits of the law. I traveled to Turkey in March and spent three weeks there, which I loved and met some amazing people there. I became aware of the current cultural and political issues and their impact on Turkish people. Now, I value the freedom I have here and recognize the importance of protecting these rights. My boyfriend and all the friends I have made in my life. As they are there when I need them. Especially, my boyfriend whose probably gained more gray hairs in the last five months, than in his entire life. I have a special mention to my old employer the Little Sisters of the Poor for all their support and prayers. Also to all my old co-workers who were great to work with and they're brilliant care practices. Now, I am grateful to have stability of new job and having a regular wage coming because it enables me to have the money to do everything I want to. Also providing me with the new challenge I've been seeking. A good cup of tea when things are really stressful, and I need to chill out there's nothing better than grabbing a nice black cup of tea with one sugar. I am very British in that aspect, that I am a total tea pot. My pajamas and bed, especially in the winter or after a hard day. As soon I get home, I love putting my pj's on and getting into bed and sprawl out. The technology I have at my disposal, mainly my netbook, despite our love hate relationship, it's traveled everywhere with me and still working. The internet's accessibility allowing me to meet people and to maintain communication between people I've met more easily. I'm able to share my blog with people who have been generous enough to read it. The fact I have a sewing machine and over-locker that works because I able to express my creativity through making one off items I can wear or use. The things and places I have seen as it gives me great memories to remember and stories to share with people.